What is heart rate monitoring? Heart rate in bpm is not comparable between individuals. Even individuals of the same gender, age and fitness background could have hugely different heart rates in the same situation. I also find that unless you have had a lot of time to familiarise yourself with your heart rate (in bpm) at different levels of exercise, the number is harder to put into perspective and to find useful. A percentage of your maximum heart rate value, on the other hand, is comparable; the same % HRmax can indicate that two individuals are working at the same training intensity. This measurement more easily provides you with some perspective on how hard you are exercising. It’s for this reason that % HRmax is the measurement recorded during group exercise classes that utilise heart rate monitoring, like Orange Theory or Speedflex. Knowing your heart rate at any point in time is not a very useful measure on it’s own. So, to put it in context, it’s a good idea to have some ideas of where you sit across other heart rate measures. Your resting heart rate should be taken when you are awake, but relaxed sedentary, in a neutral environment without any stressors. The resting heart rate in adults can vary from 60bpm to 100bpm. You can find out your own resting heart rate by counting your own pulse manually. You can also use a smartphone app, fitness tracker with a heart rate monitor, or a small device called a pulse oximeter. You can find out more in a handy article I wrote a while back on [resting heart rate]. Lower resting heart rates are commonly associated with better physical fitness. Your heart rate max is the highest heart rate that you can achieve through exercise, without encountering any severe issues from exercise stress. It’s typically said that subtracting your age from 220 will provide your HRmax, and this is the formula that most commercial heart rate monitors use to calculate default heart rate zones. Another formula that some sources suggest is more accurate, is subtracting 0.7 x your age from 208. Clearly, it’s important to realise that there is no ‘one size fits all’ approach when it comes to your individual physiology and it’s now well-established that there’s not a clear correlation between age and HRmax. The most accurate way to measure your HRmax is through a cardiac stress test, run by a professional, but these can be difficult and costly to arrange. Recovery heart rate refers to the reduction of your heart rate in a fixed period after exercise. This can be an indicator of your fitness level or of potential heart problems. To measure recovery heart rate, take note of your heart rate during exercise, and then record your heart rate after 1 minute or 2 minutes of recovery. Subtract the final heart rate from the working heart rate to give your recovery heart rate. Improvements in fitness can be indicated by a greater recovery heart rate. When heart rate training, it’s pretty important to know your heart rate zones. Exercising at a very light intensity is recommended for warm-up and cool-down periods around training sessions, and for recovery periods during high intensity intervals. This intensity should feel very comfortable and easy. Training at 60-70% of your HRmax improves general fitness by developing basic endurance and aerobic capacity. This type of training is sustainable for long duration sessions and is also used for recovery training sessions in people who train frequently and competitively. This intensity should feel like your ‘average’, comfortable intensity, during which you could maintain a conversation. Training between 70-80% of your HRmax will develop your aerobic capacity, meaning that your body's ability to transport oxygen to, and carbon dioxide away from, working muscles can be improved. This improved efficiency has a positive impact on your general training pace. In this zone, you will feel that you are working above average intensity and experience steady and controlled fast breathing. Working between 80-90% of your HRmax will put you into your anaerobic zone. Training in this zone will improve your ability to sustain high intensity activity. This is the zone where your anaerobic threshold (AT) is found. Here, the amount of fat being utilised as your body’s main source of energy is greatly reduced, in favour of using glycogen stored in your muscles. One of the by-products of using this glycogen is lactic acid. The point where your body can no longer remove lactic acid from the muscles fast enough is your AT, also known as your lactate threshold. Working in this zone causes muscular fatigue and heavy breathing. Training in this zone trains your fast twitch muscle fibres and helps to develop speed. Training in this zone is very exhausting for your breathing and muscles and can only be maintained for a very short periods of time. Only very fit individuals and experienced athletes can train effectively at this intensity. You may have heard of the fat burning zone and wonder where it fits into these 5 training zones. During exercise, your energy comes from two sources, carbohydrates and fat. Your body requires the presence of oxygen in order to metabolise fat. Therefore, in terms of training, it’s in the aerobic (meaning, oxygen is present) training zones where the highest rate of fat oxidation occurs. What this means, is that when you exercise at a lower intensity, your body burns a higher proportion of energy from fat than from carbohydrates. Whereas, when working at a higher intensity, your body will predominantly use carbohydrates for energy. Ultimately, while you may use a smaller proportion of fat for energy working at a higher intensity, your overall energy expenditure is higher. It would be counter-productive for your overall health and fitness to deliberately slow your workout pace down to ensure that your heart rate resides in ‘the fat burning zone’ unless you are deliberately trying to pace yourself for competitive endurance training. Excess Post-exercise Oxygen Consumption (EPOC) (also sometimes referred to as ‘exercise afterburn’) is exactly what it says on the tin. It’s the phenomenon whereby there is a measurably increased rate of oxygen intake following strenuous activity, intended to erase the body's "oxygen deficit". To be clear, you do not experience EPOC simply because you have been breathing faster and harder (consuming more oxygen) during exercise. In fact, EPOC occurs because oxygen is required for a number of metabolic processes that help to return your body to it’s pre-exercise state, once your workout is done and dusted. To really grasp this concept, you should understand that ‘metabolism’ is a generic term for all of your body’s chemical reactions that require energy/calories. You have a higher metabolism after exercise due to a number of physiological mechanisms within your body, including replenishment of oxygen stores, adenosine triphosphate/creatine phosphate resynthesis, lactate removal, and increased body temperature, circulation and ventilation above pre-exercise levels 1. This higher metabolism requires a greater consumption of oxygen, leading to the term, ‘EPOC’. This higher metabolism also means that your body is using more energy, which is why many high intensity workout classes claim that you will experience a greater calorie burn for hours (and even days!) after your workout. However, studies have found that the extent and duration of EPOC is dependent on the intensity and duration of exercise. If your workout is low in intensity and short in duration, you will likely not experience EPOC. If you do experience EPOC, it can last anywhere from 15 minutes to 48 hours after your workout. There are a number of other factors that can influence your heart rate, and it’s useful to be aware of these when you are training. The main culprits for raising your heart rate a little more than usual are dehydration, heat and humidity, altitude (even if you are acclimatised) and small everyday biological variations. What are the benefits of heart rate monitoring? There are many benefits to using a heart rate monitor, which is why athletes and sports team, along with their coaches, have been using them for decades. Whether you want to improve your endurance, or perform better at higher intensity activity, there is a heart rate zone that corresponds to your goal. Wearing a heart rate monitor allows you to see when you are in your ideal zone so that you know you are on target and can maintain that pace. Alternatively, if you are just short of your target heart rate, seeing how close you are using the data on the screen can give you that extra push of motivation that you need to get there. If your goal is to develop good fitness across the board, you could use a heart rate monitor to ensure that each workout that you do favours a different type of activity, based on heart rate. Especially if you’re a novice at endurance sport like running (like me), a heart rate monitor can help you to pace yourself. On the few long runs I’ve done, I’ve found it pretty easy to be overzealous and tire myself out prematurely, and I’m sure that I’m not alone. A heart rate monitor can definitely help to develop a sense of speed and effort. Heart rate monitors are typically recommended for resistance training sessions, but they can actually be very helpful in monitoring your rest periods between sets. If you’re lifting very heavy weights as part of a strength training programme, it’s important to give yourself adequate rest between sets so that your muscles, as well as your cardiovascular system and nervous system, can recover. Often, trainers will set a standardised rest period of, say, 3 minutes. But as we know that everyone responds differently, it may be more beneficial to instead rest until your heart rate reaches a low enough level. On the flip side, if you are lifting lighter weights and are looking to improve cardiovascular fitness and get more out of your session, you might like to ensure that your heart rate doesn’t drop below a certain point before moving on to your next set. By taking your resting heart rate every morning, you can calculate your average RHR over time. If your RHR creeps up above your normal level (probably by about 7 bpm or more), it may be that you are exhibiting signs of fatigue, illness or overtraining. Modern heart rate monitors are able to sync your data with an app to store your data. This means that you can review how your heart rate has changed over time to monitor your fitness levels, or monitor how your workouts appear to have changed over time, in structure, intensity or duration. I wouldn’t be without my heart rate monitor when I’m doing interval training. As you can see from the Polar Flow app screenshots above, I like to add interval training on to the ends of my strength sessions and it's very clear how it affects my heart rate! Currently, my preferred form of HIIT is treadmill sprints. I’ll warm up with a short walk and then sprint for 30 seconds at a time followed by 30 seconds of rest, ten times over. I check my heart rate monitor after each interval and if it’s a little lower than where I’d like it to be for maximum benefit, I’ll push up the speed or the incline. I love weight training and the concept of heart rate monitoring, but it took me a while to learn to fuse the two. Typically, heart rate monitors are aimed at people taking part in traditional cardio forms of exercise, and even some trainers that I spoke to couldn’t suggest how to make use of a heart rate monitor during my weight training sessions. Heart rate monitoring is generally focused around monitoring the intensity of the exercise that you are performing. But with weight training, I found it was more beneficial to flip this concept on it’s head to monitor the time spent at rest. I generally have quite short training sessions - sub 1 hour - so I want to ensure I make the most of them. Therefore, I started using a heart rate monitor to ensure that my heart rate didn’t drop below a level during rest periods, so that I could improve my cardiorespiratory fitness at the same time as working my muscles. Sometimes, that means that I will have have slightly shorter rest periods than I have programmed for, or it might mean that I learn to super-set exercises to keep my heart rate high. For example, if I’m doing an overhead press, I may need a decent 1 or 2 minutes for my shoulders to recover before the next set, so I’ll add in some squat jumps during that time. Which heart rate monitor should you use? There are generally two types of heart rate monitor. Heart rate monitors with chest straps use electrodes to pick up the small electrical signal that causes each of your heartbeats. This type of heart rate monitoring is called electrocardiography (ECG or EKG). Alternatively, optical heart rate monitoring (OHRM) is now available too. They measure your heart rate by shining light through your skin and onto your blood vessels, and then analysing the amount of light that returns to the sensor. The heart rate measurement is based on the fact that light entering the body will scatter in a predictable manner as the blood flow dynamics change, such as with changes in blood pulse rates (heart rate). This method is called photoplethysmography (PPG). The latter is far less reliable than a chest strap, especially when training. Measuring PPG when you’re in a resting state (sleeping, sitting, and standing still), such as when doctors use pulse oximeters (or when I do this at home as part of my clinical trial), is fairly simple. However, measuring during activity is far more complex. It can be inaccurate due to a number of factors including ‘optical noise’ and measurement delays; they aren’t responsive to rapidly increasing or decreasing heart rate, such as the fluctuations associated with interval training. Simply, the more athletic you are, the more you will benefit from wearing a chest strap. I agree with the industry experts’ view that people should be made more aware of these shortcomings of optical heart rate monitors. I’ve selected two of my favourite heart rate monitors, one ECG one PPG, below to give you an overview of how each of type of heart rate monitor works. Note: I won’t focus on their functionality as a fitness tracker, although they are both able to track steps and sleep, as you would expect. They also have a vibrating inactivity alert. I’ve always considered Polar to be the gold standard when it comes to heart rate monitoring. It was always clear to me that the brand specialises in heart rate monitoring, even before I started to use their products. 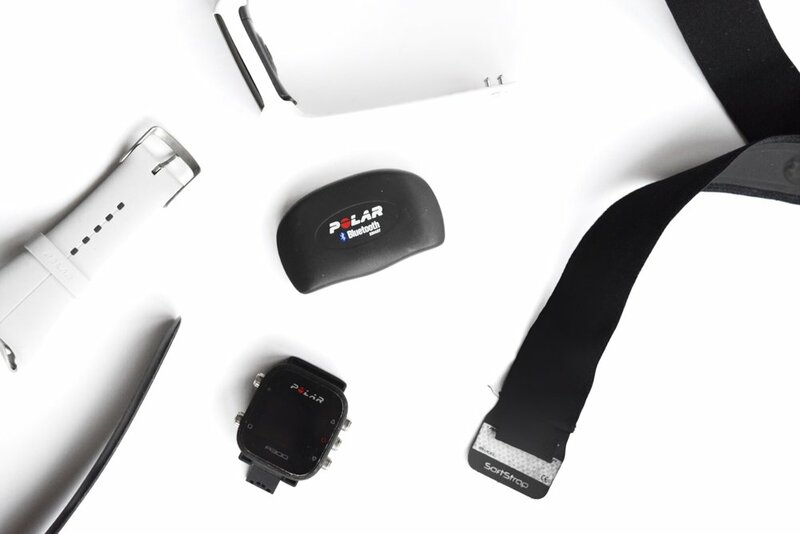 When I first decided to get a heart rate monitor, I loved browsing the Polar site because they had such a comprehensive yet accessible range of products, catering to everyone from the beginner gym-goer to the elite athlete. Recently, I learnt that Polar’s image as a pioneer in heart rate monitoring isn’t just due to great marketing. In fact, nearly 40 years ago Polar filed its first patent for wireless heart rate measurement and in 1982, launched the first ever wire-free wearable heart rate monitor, changing the way athletes trained forever. This is the first heart rate monitor that I have owned and I love it. I use it several times a week during my workouts. Obviously, the chest strap is usually discretely positioned so that the look of it doesn’t matter, but I am conscious that the watch is quite bulky. I currently use it with a black strap but will consider purchasing and switching to a white wrist band for summer. I currently find the bulkiness most annoying if I choose to wear it as an activity tracker for an extended period of time, but in the gym, it doesn’t bother me in the slightest. I find both the watch and the chest strap really comfortable to wear. This is really easy to use, connects effortlessly to the heart rate monitor, syncs easily with the Polar Flow app on my smartphone. It’s also simple to charge with a USB cable, with the battery life lasting around a month. My only complaint is that I’ve felt from the very first time that I used it that there was a critical piece of functionality missing: a timer/stopwatch function. For a sports watch, I feel this is a basic element to have been omitted. I had anticipated that one of the benefits to having my fitness tech on my wrist, would be simplicity and compactness, but it turns out I still need to carry round my phone or a stopwatch if I want to be able to time rest periods or intervals. The device displays the total duration of your workout, including hours, minutes and seconds, but this is not an easy format to time from. However, I’d like if the display gave the option to switch between seeing your heart rate as %HR max and bpm. Currently, the device requires you to set a single preference on the app. The Polar A300 is £74.50. Purchasing it with a heart rate sensor is £99.50. Changeable wrist straps are £19.00. Unlike most fitness trackers, the A360 has a colour touch screen. It’s this, along with the slim in-line shape, that creates the sleek aesthetic that drew me to it. The colour screen is especially beneficial in communicating the heart rate zone that you’re working in during a workout. It’s available in a range of interchangeable colours, and three band sizes from small to large. Like the A300, the watch itself is really simple to set up and use, and easy to sync with the Polar Flow app. It’s also easy to charge with a USB cable, although given my intermittent use of this device, I can’t justify the relatively shorter battery life of 14(ish) days. I like that you can pair it with a chest strap for more accurate measurement too. I’ve yet to try this out but I definitely will. The A360 also has the functionality to give you smart notifications, drawing your attention to incoming calls, messages and other alerts from your phone. However, this isn’t something that I’ve had the need to use. The main downside with this watch (besides the limitations of optical heart rate monitoring on the whole) is that, as with the A300, I feel that this would benefit from a timer/stopwatch function. Plus, like with the A300, I’d like the option to see my heart rate in both %HR Max and bpm side-by-side. The Polar A360 is £149.50. Changeable wristbands are an additional £19.00 and to buy it with an H7 heart rate strap will set you back an additional £52.50. I use the A300 every time that I train without fail and have done for months. It’s undoubtedly the longest that I’ve ever stuck at using a piece of fitness tech. As I’ve mentioned before, I actually don’t find wearable fitness trackers useful on an all-day basis, so I tend to keep both the watch and the chest strap in my gym bag, not wearing either unless I’m at the gym. While I much prefer the aesthetic of the A360, including both the wristband itself, as well as the unique colour screen, I haven’t found myself reaching for it quite so much. Partly, this is due to the inaccuracies of optical heart rate monitors in general. Also, I think this is due to the fact that the battery runs down faster than the A300 and honestly, I already have so many devices to charge that I really don’t need another one on more frequent charging rotation! If you’re looking for a device to wear on a daily basis, I’d recommend the A360. If you’re looking for something simply to wear only while you train, I find the A300 to be perfect. Related Article: Are Fitness Trackers A Waste Of Money? I love the concept of a quantified self. Self monitoring can be so valuable when applied correctly. I’ve really benefited from heart rate monitoring. It has motivated me, encouraged me to push harder, rest better, and ultimately learn more about my body. I really like that your heart rate provides an objective gauge of exertion; one which is usually more accurate than your own perception of how you’re working. No more excuses!